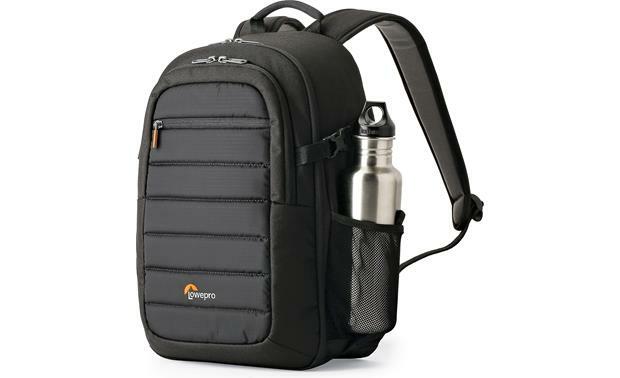 The Lowepro Tahoe BP 150 offers the convenience and security of a backpack, with configurable internal dividers that help organize and protect valuable camera bodies and lenses. You can also carry a 10" tablet in the padded internal pocket. Thank you Crutchfield. The blue color bag has everything and will be perfect for my camera for sure. You guys are the best. If anyone wants Music this is the place for music box blue tooth. Products are solid. 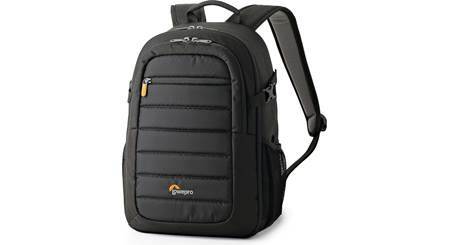 Overview: The Lowepro Tahoe BP 150 is a customizable padded backpack for your DSLR and accessories. 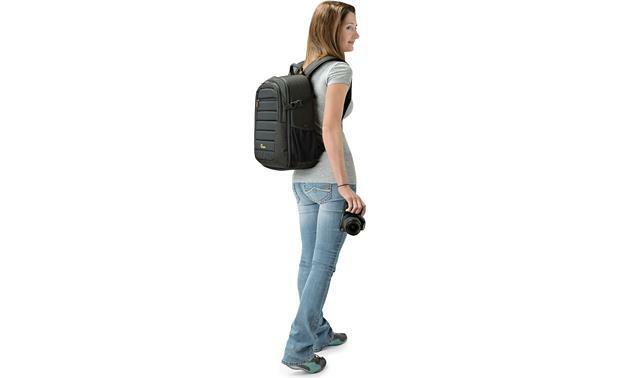 With numerous compartments and pockets, the Tahoe BP 150 can hold extra lenses, flashes, and a 10" tablet. You can remove the internal dividers to make room for more of your personal items. UltraFlex Panel: The main compartment features a zipper on three sides, allowing you complete access. At the top, the UltraFlex panel lets you create a separate interior compartment with zippered access, or you can open it up to expand the main compartment. Main Compartment: The roomy main compartment features padded dividers that you can configure any way you desire. You can easily carry your DSLR with an attached long telephoto zoom lens. Smaller compartments let you store short lenses upright, or lay longer lenses on their side. When not carrying your camera gear, the internal dividers can be removed so you can use the bag as a daypack. 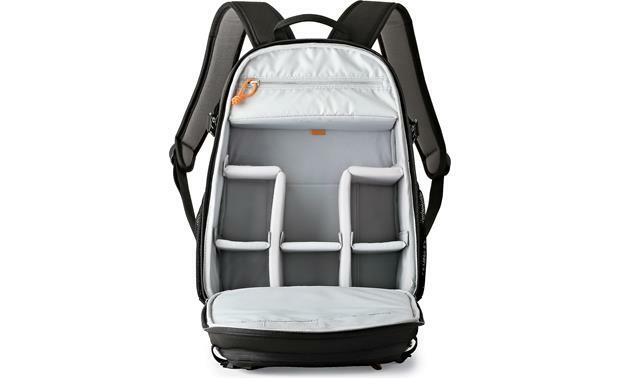 Elastic straps with clasps are provided on both sides of the backpack to temporarily close the main compartment without using the zipper. Front Pocket: The deep front pocket offers plenty of room for notebooks, owner's manuals, and other less bulky items. Smaller internal organizer pockets are provided for pens, keys, and other personal items. An 8" wide x 10" deep protective CradleFit pocket gives you room for a tablet. Exterior Pocket: The Tahoe BP 150 has a 6" wide x 7" deep zippered pocket on the outside for storing personal items for quick access. 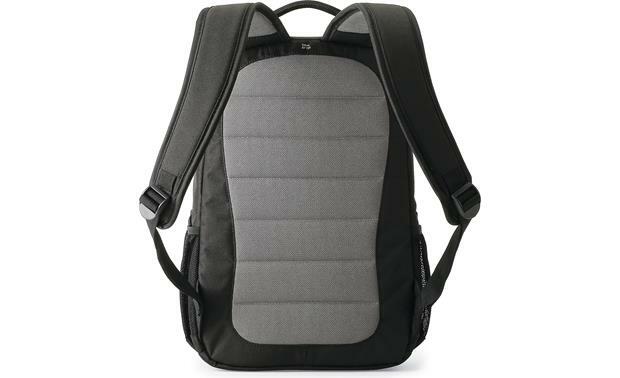 Side Mesh Pockets: Tall stretchy mesh pockets are provided on each side of the backpack to accommodate water bottles, small tripods, or other items. 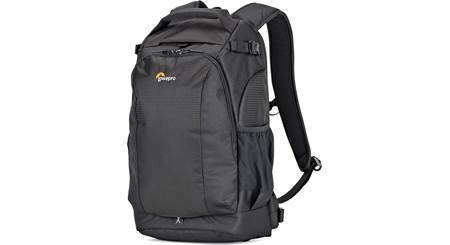 Straps/Handle: The backpack is equipped with 2-3/8" wide, adjustable padded shoulder straps for a comfortable fit. 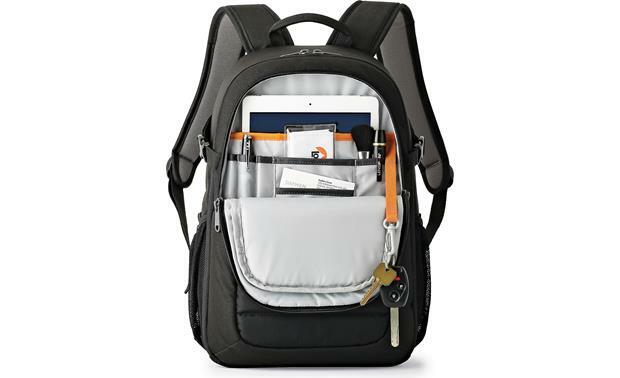 A padded grab-handle at the top lets you grab the backpack and go. 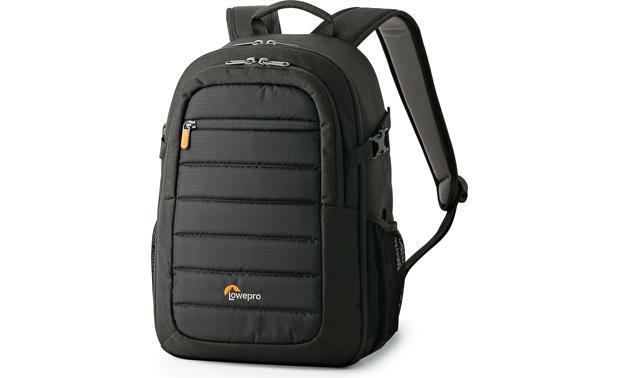 Searches related to the Lowepro Tahoe BP 150 Backpack for carrying camera and accessories.